Not conferences...festivals! Cutting edge technology sessions and demos in a laid back environment. Food trucks, breweries, massage, games, and more. In person and virtual attendee options. 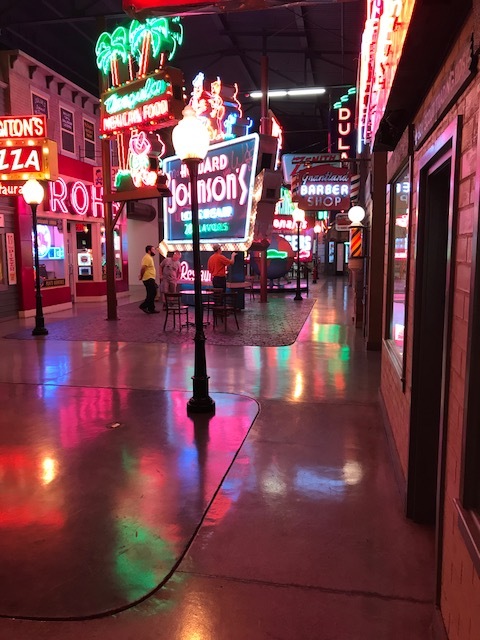 Our inaugural one day disability technology festival will be held on October 15th, 2018 in Cincinnati at the American Sign Museum. We are also allowing virtual attendees through Zoom and Facebook Live! This is your opportunity to exhibit, do a short Ignite-style presentation/demo (to a live and virtual audience around the country! ), position your brand as a disability technology expert, and have your product/solution discussed in our "innovation-storming". Non-technology exhibitors and sponsors can apply. Come join us in the most unique laid back environment for a day of networking, food trucks, games, massage, and whatever else we dream up.....this is not a typical conference. You know the drill. Set up your booth at your 6&apos; table and show off your great products,services, and solutions. Exhibitor package plus.....your company rep at our festival massage chair. Don&apos;t worry you don&apos;t have to give the massage. Have a rep chatting with people waiting to get pampered.See other benefits below. Exhibitor package plus.....your company front and center in our conference app. We are looking to do some neat things with this. See other benefits below. Exhibitor package plus.....your company logo on t-shirts given to all attendees. Get exposure on the event day and every day they wear them. See other benefits below. Exhibitor package plus.....your company sponsors lunch from a local food truck or vendor.Maybe attendees get your brochure as a napkin (kidding...well maybe not), you hand out the food with a smile, or whatever. Let&apos;s discuss what would work best for you. See other benefits below. Exhibitor package plus.....your company brand/logo/message featured all over the place at the event and other communications throughout the year. Free booth at our golf outing, host a webinar, have a show on our upcoming podcast, be a formal member of our advisory council,and lock in rates for the year at other festivals. Let the disability community know you are serious about supporting their goals. See other benefits below. Exhibitor package plus.....well.....basically all sponsor level benefits and whatever else we agree on. This is a custom package that you can mold to best meet your needs. We are looking for a special partner to be the Disability Cocoon LAUNCH PARTNER. See other benefits below and call us to discuss options. Let&apos;s create this movement together. I&apos;d love to connect. Here&apos;s my calendar link to make finding time easy. This is still a work in progress. We are inviting leaders in disability technology from around the country to bring you the latest and greatest innovation available. Check back from time to time to see updates to our schedule. Register, get fueled up, and start exploring great disability tech offered by our exhibitor partners. A short run down of the days events and what to expect at the Disability Cocoon Technology Festival. How we can apply lessons learned from the past in our industry, to give current and future leaders insights into how to tackle our industry&apos;s biggest challenges. Stretch the legs and see our exhibitors&apos; latest and greatest. See solutions; not sales pitches. Multiple short and sweet talks hitting the import topics and then moving on to another one. Content packed! Find your favorite lunch from one of our food trucks or vendors. Lori Horvath with DODD (OH), Harold Sloves with DIDD (TN), and two TBD representatives from IN & MN have an interactive moderated lunch panel conversation. Get several states&apos; perspectives. Multiple short and sweet talks hitting the import topics and then moving on to another one. See solutions; not sales pitches. When most people hear the word “technology”, they immediately think of expensive and complex devices like smartphones, tablets, and laptops. While these devices are amazing in their own right there are many other forms of technology that can offer increased independence to people with disabilities. And, with budget shortfalls, we find the need to be more creative than ever with our limited dollars. Technology is about Enhancing Capabilities (TEC). Solutions don’t have the be expensive or complex. They don’t have to be designed and built by technology experts. In this session, participants will have the opportunity to “roll up their sleeves” – to be guided through the process of building practical pieces of assistive technology using supplies that are available from their local hardware store. In addition to taking the devices built during this seminar home, attendees will be exposed to a number of commercially available products that address common challenges faced by people with disabilities. The country is experiencing a surge of job openings. This is the good news and the bad news. It presents unique challenges to the I/DD field. There are innovative ideas proven to increase applicant flow, increase DSP compensation organically and improve the quality of care. Overview of the Disability Cocoon vision and future goals. Also, get your feedback on what worked and what we can improve. You are part of the movement, tell us what you think...please. Meet us at a location TBD for drinks/dinner and continue the discussion. We are planning more of the same!